The molcajete was used by pre-Hispanic Mesoamerican cultures, including the Aztec and Maya, stretching back several thousand years. Traditionally carved out of a single block of vesicular basalt, molcajetes are typically round in shape and supported by three short legs. They are frequently decorated with the carved head of an animal on the outside edge of the bowl, giving the molcajete the appearance of a short, stout, three-legged animal. The pig is the most common animal head used for decoration of this type. In the pre-Hispanic Mesoamerican period, the molcajete had a lid and the set was believed to be used for burial of members in society of high-status. Additionally, throughout the pre-Hispanic Mesoamerican period, they were decorated by various colors and designs, and orange wares were identified as the most common characteristic of the molcajete. The matching hand-held grinding tool, known as a temolote (Mexican Spanish, from Nahuatl texolotl), is also made of the same basalt material. Molcajetes are used to crush and grind spices, and to prepare salsas and guacamole. The rough surface of the basalt stone creates a superb grinding surface that maintains itself over time as tiny bubbles in the basalt are ground down, replenishing the textured surface. A new basalt molcajete needs to be "broken in" because small grains of basalt can be loosened from the surface when it is first used and this will give an unpleasant gritty texture to the first few items prepared in it. A simple way to do the initial "seasoning" is to grind uncooked white rice in the molcajete, a handful at a time. When the white rice flour has no visible grains of basalt in it, the molcajete is ready to use. Some rice flour may remain ground into the surface of the molcajete, but this causes no problems. 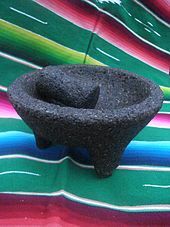 Molcajetes are also used as dish service in restaurants and homes. While recipes are usually not stewed or otherwise cooked in them, the molcajete stays hot for a very long time due to its high thermal mass, and it is not unusual for a dish to still be bubbling a half-hour after serving. ^ Mc Kelvey, Anita (18 October 2011). "The Original Chile Grinder". The Philadelphia Pepper Project. Retrieved 20 September 2018. ^ Simmons, Marie (2008). Things Cooks Love: Implements, Ingredients, Recipes. Missouri: Andrews McMeel Publishing. p. 75. ISBN 0740769766. ^ Moser, Chris L. "Matching Polychrome Sets from Acatlan, Puebla." American Antiquity 34, no. 4 (1969): 480-83. doi:10.2307/277749. Adams, Richard E.W. (2005). Prehistoric Mesoamerica (3rd ed.). Norman: University of Oklahoma Press. ISBN 0-8061-3702-9. OCLC 58975830. Coe, Sophie D. (1994). America's First Cuisines (4th pbk printing , 1st ed.). Austin: University of Texas Press. ISBN 0-292-71159-X. OCLC 0292711557. Simmons, Marie (2008). Things Cooks Love: Implements, Ingredients, Recipes. Missouri: Andrews McMeel Publishing. ISBN 0740769766. 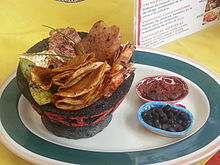 Look up Molcajete in Wiktionary, the free dictionary.